Join Lee Jeans and the American Cancer Society for today's Denim Day! 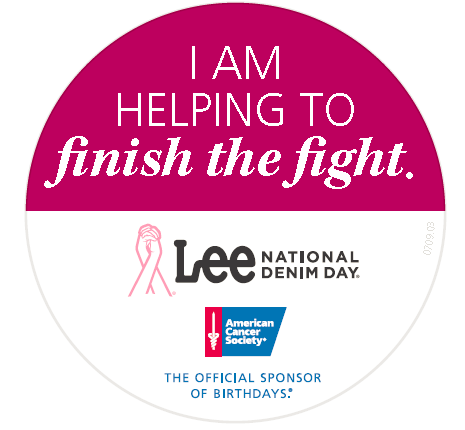 MERRIAM, KS, October 3, 2014 /3BL Media/ – Lee® Jeans encourages people to celebrate Lee National Denim Day today by putting on their jeans and donating $5 to the American Cancer Society’s fight against breast cancer. Lee National Denim Day has focused on raising money for the Society’s life-saving breast cancer research and support programs since 1996. Denim Day has raised more than $91 million to date, and today Lee Jeans hopes to add millions more to that total. With the American Cancer Society as Denim Day’s beneficiary, funds raised will support critical screenings in communities nationwide; provide a free place to stay for those traveling away from home for cancer treatment; and invest in groundbreaking cancer research. Breast cancer is the second-leading cause of cancer death among women, with more than 232,000 women expected to be diagnosed in 2014 with about 40,000 deaths. This year, three Lee National Denim Day ambassadors are leading the initiative – breast cancer survivors Catherine Aplin of Macon, Ga., Beth Borden-Goodman of Atlanta and Laura Renegar of Charlotte, N.C. Aplinwas diagnosed with Stage 3 breast cancer at age 21 and is now a seven-year survivor. Borden-Goodman, also a seven-year breast cancer survivor, had several lumpectomies beginning in high school before being diagnosed with breast cancer in 2007. Renegar is a three-year breast cancer survivor who was diagnosed with triple negative breast cancer and the BRCA2 gene. All are putting their breast cancer experience and fighting spirit to work to help other women battle and overcome breast cancer. Lee National Denim Day is committed to improving the everyday lives of those with breast cancer – past, present and future. Fifty percent of net proceeds raised through Lee National Denim Day will benefit community-based programs, including breast cancer screenings and the American Cancer Society Hope Lodge® initiative, which provides cancer patients and their families a free place to stay when they have to travel away from home for treatment. In 2013, more than 265,000 nights of free lodging were provided to 43,000 patients and caregivers nationwide, saving them nearly $38 million in hotel expenses. The remaining proceeds of Lee National Denim Day will help fund American Cancer Society's national research grants to find cures for breast cancer. As the largest private, not-for-profit funder of cancer research, the Society has contributed to nearly every cancer breakthrough in recent history. Their funded researchers have helped develop the drugs to treat advanced breast cancer and have shown that mammograms are the most effective form of detection. It’s not too late to hold your own Denim Day – we’re celebrating all month long! Register your team at www.DenimDay.com. Donations will be accepted through December 31, 2014. Lee® Jeans is a division of VF Corporation. (NYSE: VFC). Headquartered in Merriam, Kan., Lee manufactures and markets brand denim, casual pants, shirts, fleece and knit apparel. A brand committed to the community, Lee Jeans founded Lee National Denim Day®, one of the largest single-day fundraisers for breast cancer. For more information about Lee, visit www.lee.com.